For the first time, a natural source of infrasonic waves of Earth has been measured directly from space—450 kilometers above the planet's surface. The source was the massive 2011 Tohoku-Oki earthquake in Japan, and its signature was detected at this orbital altitude only eight minutes after the arrival of seismic and infrasonic waves, according to Jet Propulsion Laboratory and Caltech's Yu-Ming (Oscar) Yang and colleagues in collaboration with the University of New Brunswick, Canada, who present their research today at the annual meeting of the Seismological Society of America (SSA). Infrasonic waves, with frequencies much lower than an audible voice, can be generated by sources as diverse as volcanoes, earthquakes, rocket launches and meteor air blasts. Their signature can be detected in the upper atmosphere as either fluctuations in air pressure or as electron density disruptions. In the case of the 2011 quake, the Gravity Recovery and Climate Experiment (GRACE) satellites orbiting Earth captured the significant ionospheric signature produced by the quake's infrasonic wave output. The GRACE measurements were similar to those captured by ground-based GPS and seismic stations, the researchers note. The findings suggest that these satellite-based measurements could be useful in future early warning systems of natural hazards. 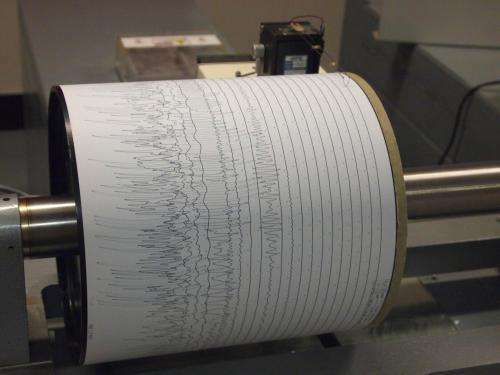 The analysis also lends more support to the idea that such detection systems could be useful in measuring seismic activity from space, as would be the case for infrasonic detection missions like those envisioned for the atmosphere of Venus.